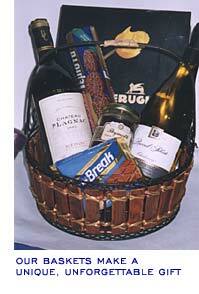 We also make gourmet gift baskets. They can also be custom made to your specifications. We use only top quality products. Our baskets are different and unusual which gives our baskets a one of a kind unforgettable look. Your gift will not go unnoticed. In addition, they are a fantastic value! NOTE: We no longer sell baskets that contain wine or other alcohol.